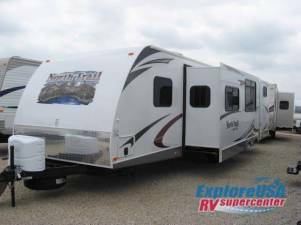 North Trail King Slide Bunkhouse Travel Trailer w/Double Slideouts, Rear Sofa Slide, Ent. Center w/Bunk Above, Bath w/Private Entry, Tub/Shower, Toilet & Lav., Closet, U-Shaped Dinette & 2nd Sofa Slideout, Refrigerator, 3 Burner Range, Dbl. Kitchen Sink, Swivel TV Ent. Center, Front Queen Bed w/Nightstands, Shirt Closets and More!